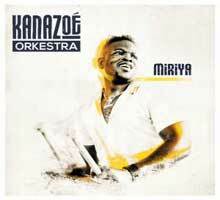 Seydou Diabaté, aka Kanazoé, unleashes his technique on the balafon with a talented ensemble on Kanazoé Orkestra's debut full-length release, Miriya. 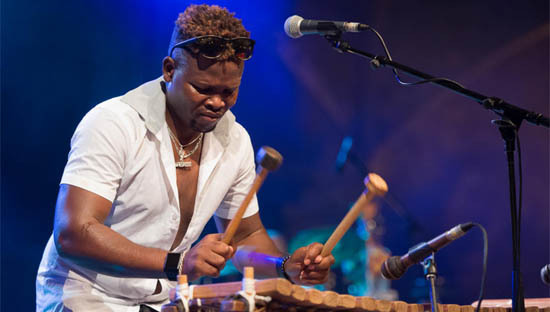 Born in Burkina Faso to a family of griots, Kanazoé started learning music from his father at the age of five. Now based in France, he and his band offer an impressive, mature record that maintains an urgency throughout. Kanazoé provides some vocals in the Dioula language and plays a variety of balafons on the album. His group includes Zaky Diarra on lead vocals, Mamadou Dembélé on ngoni, flute, and vocals, Martin Etienne on saxophones, Stéphane Perruchet on percussion, Elvin Bironien on bass, and Laurent Planells on drums. Kicking things off, “Fantanya” unveils the impressive strength and depth of this recording. The sound is immediately full and flexible, syncopated with balafon, saxophone, percussion, and bass. The lyrics address poverty and how it strikes like a disease. “Kélé” hastens the pace with a powerful song about the tragedy of war. Bironien lays down a relentless bassline while Kanazoé's balafon joins the percussion and Etienne's saxophone to create an impressive platform for the vocals. The mood shifts while they detour down a jazzy path, eventually cycling back and hitting hard for another verse. The title track is a reflective song offering a range of thoughts, wrapped in a mystical arrangement enhanced by Diarra's vocals and Dembélé's flute work. “Faden Yélé” is a gleaming composition that features celestial ngoni playing in a tight performance. Vigilance is the theme of “Dianto,” a track that starts slow with intense flute and serves as an introduction to “Nafolo,” which cranks up the tempo in a song about money. “Why?” is a nice instrumental piece that transitions to the brilliant “Dianfa.” This song about treason maintains the tension found in other places on the album and uses it to great effect in a pulsing arrangement. “Nanifa” is a song for Kanazoé's parents that slides into a purposeful swing. “Folo Folo” adjusts the mood with more ngoni and some subtle balafon in a composition that looks back to the old days. “Dianamogo” brings listeners back to the edge of their seats with an uptempo track about love featuring some more of Kanazoé's dynamic and explosive balafon playing in a tenacious groove. “The Road” closes the album with a rapid flurry of percussion, ngoni, saxophone, and bass.